Jason Aldine Williams (born February 28, 1977, in Macon, Georgia) is an American country music singer, known professionally as Jason Aldean. Since 2005, Aldean has recorded for Broken Bow Records, an independent record label for which he has released four albums and sixteen singles. His 2005 self-titled debut and 2009 album Wide Open are both certified platinum by the Recording Industry Association of America (RIAA), while 2007′s Relentless is certified gold. Of his singles, eight have reached the number one position on the Hot Country Songs charts: “Why”, “She’s Country”, “Big Green Tractor”, “The Truth”, “Don’t You Wanna Stay” (a duet with Kelly Clarkson), “Dirt Road Anthem”, “Fly Over States”, and “Take a Little Ride”. Seven more have reached top ten on the same chart. 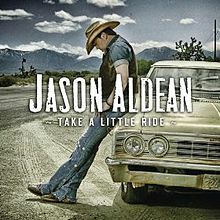 “Take a Little Ride” is an up-tempo country rock song written by Dylan Altman, Rodney Clawson and Jim McCormick, and recorded by American country artist Jason Aldean. It was released to country radio and iTunes on July 16, 2012, serving as the lead single from his upcoming fifth studio album, Night Train, set to be released on October 16, 2012.